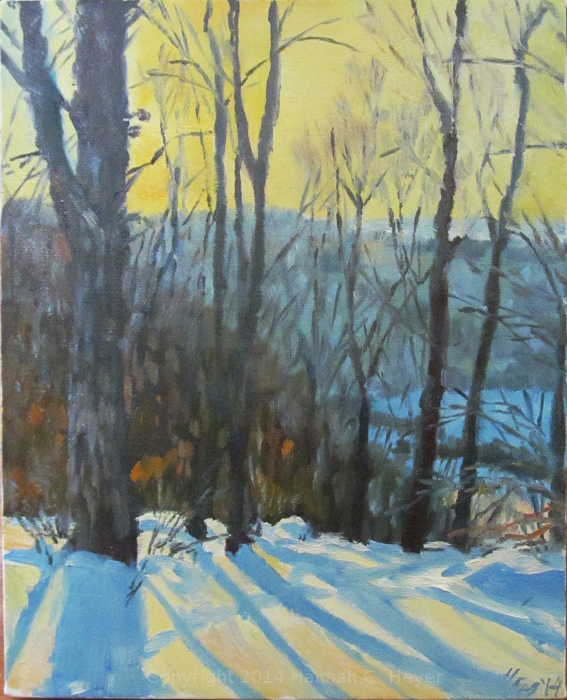 On Wednesday, I finally got to paint my first plein air painting of this winter. It's been about 2 months since I've been out painting, and though I felt a little rusty and clumsy, and before long, freezing, it felt good to be out again. This winter has been so cold, a "normal" day felt like spring. But I wore the wrong mittens (warm, but akin to oven mitts and I can't hold a paintbrush in them) and it really was too cold for bare hands! I loved the long blue shadows, and the colors of the bluffs as the sun got low in the sky. I hope for some warmer days and more painting time soon.